You are in luck! We have a couple tickets to give away to our upcoming Wine Tasting Seminar. If you ever wanted to learn the basics of sipping and appreciating wine, we set aside a couple tickets each class for those looking for a more cost effective way into the class. These tickets are for Saturday January 5th, 2019. Entry into this ticket giveaway is pretty simple. We’re looking for enthusiastic individuals to join us for the evening. Sitting for a few hours, sipping and discussing different wines in the safety of a school environment can be fun. Even more fun when the tickets are FREE! Share with us a phone number as well, just in case we can’t get ahold of you by email. That’s it! Easy to enter and we respond to every entry. We will notify the winner 72 hours before the event… so you should have lots of time to plan for the evening. 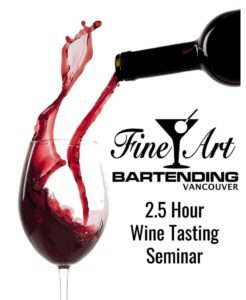 Fine Art Bartending is located in Downtown Vancouver. 432 W Pender, between Richards and Homer on Pender Street. The map below should give a better idea of exactly where we are. We are on Pender, between Richards and Homer. Directly across from the Ramada and Yagger’s.